Gasthof Hinterbrühl is located in a nature protected area of the Isar banks in southern Munich, right in front of the Hinterbrühler Lake. 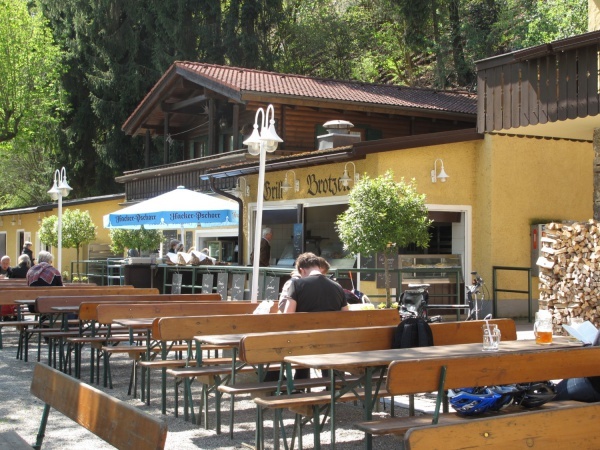 The very popular and busy beer garden lies at the Isar channel, which runs parallel to the Isar river. Hinterbrühl has a history of over 200 years. The main building stands on the grounds of a former quicklime production facility. In the 18th century the lime production closed down and the Gasthof Hinterbrühl was founded. After the opening of the nearby rafts mooring station, the inn served as a restaurant to the raftsmen. Due to its idyllic location, the inn also became popular amongst Munich's locals. 1909 the inn was extended and rebuilt to its present alpine style. 1991 the listed building was taken over and renovated by the late Karl Heinz Wildmoser Senior, the longstanding club president of the TSV 1860 München football team. In 2011, Hinterbrühl was further renovated by its current leaseholder Gerry Haberl. The self-serviced area offers about 1,000 seats under large chestnut trees. The 450 seats on the waitress served terrace are shaded by chestnut trees in combination with huge blue sun umbrellas. Guests of the served area sit at massive wooden benches with backrest. Some of the tables offer a view onto the Hinterbrühler Lake. During the summer months large rafts pass by along the Isar channel as the end station of their journey is just a few metres from the beer garden. The food stalls in the self-serviced area offer typical Bavarian beer garden meals, such as Hendl (roasted chicken), spareribs, Leberkäs (liver loaf), Obatzda and Wurstsalat (sliced sausage salad). The beer served is Hacker-Pschorr and a Maß Hell (lager) costs €7.50 (May 2018). 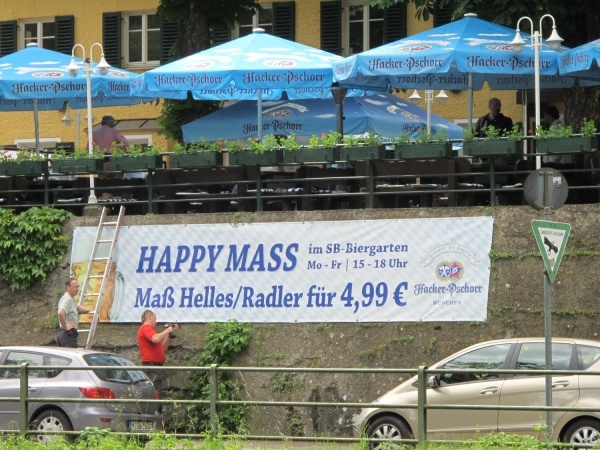 Between 3pm and 6pm on weekdays throughout the summer season a “Happy Mass” is €6.50 (May 2018) in the self-serviced area, which is surely one of the best prices for a Maß in any Munich beer garden. A Kuchenhäuserl (cake stall) offers fresh Auszogne and cakes. In the months of July to September and depending on the weather a barbecue takes place every Thursday in the beer garden. The very cosy Bräustüberl, Jägerstüberl, Flößerstube and Isarstüberl in the main building offer the right atmosphere for venues of all kinds. Gasthof Hinterbrühl has been nominated the most beautiful excursion restaurant and the second most beautiful beer garden in Upper Bavaria. 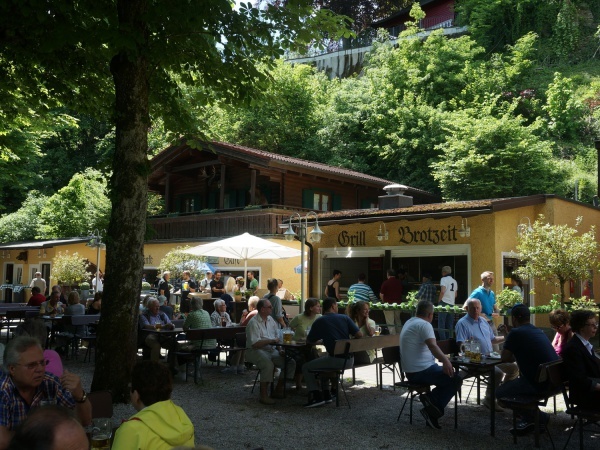 Located nearby the beer garden is a small golf course, the Thalkirchen campsite and the Naturbad Maria Einsiedel, an outside swimming pool with untreated water. Depending on the weather, the beer garden is open daily between 10am and midnight. This page was last modified on 18 May 2018, at 19:00.